A unique, largescale survey of the works assembled by Amsterdam collectors Martijn en Jeannette Sanders. 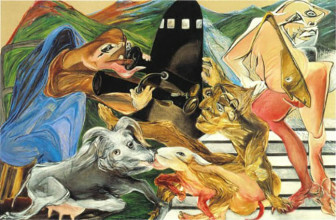 With work by a.o. 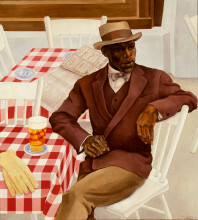 David Claerbout, Gilbert & George, Anton Henning, Anselm Kiefer, Cindy Sherman, Tjebbe Beekman, Gregory Crewdson, Günther Förg, Johan Grimonprez, Markus Lüpertz, Aernout Mik, Ronald Ophuis en Marijke van Warmerdam. 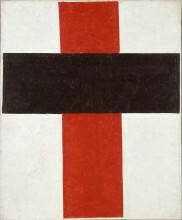 The Sanders Collection is one of the most important private collections in the Netherlands and contains a diverse array of several hundred paintings, sculptures, assemblages, photos, drawings, text-based artworks, films, videos, and installations by over 350 mostly European and American artists. 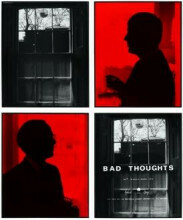 The title of the exhibition, BAD THOUGHTS, is derived from a photo work by Gilbert & George. It’s a light-hearted comment on the adventure of private art collecting, as well as the interest in the darker side of the human psyche, evident in many of the works in the Sanders Collection. 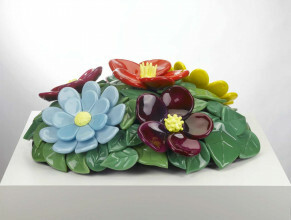 Martijn and Jeannette Sanders began collecting art in the 1970s. Unlike many private collections, the Sanders Collection is notable for featuring a significant group of “core artists” whose work is represented in great depth, including Ger van Elk, Gilbert & George, Anselm Kiefer, Cindy Sherman, David Claerbout, Thomas Demand, and Anton Henning. The collection also holds a substantial body of conceptual art and “narrative art” of the 1970s, and German painting of the 1970s and 1980s (Lüpertz, Penck, and Baselitz). For the Sanders, collecting art is both a personal matter and an intuitive process. It is their way of life, and their collection reads as a journal. The exhibition BAD THOUGHTS is dedicated to Adriaan van Ravesteijn and Geert van Beijeren of Art & Project (1968-2001), with whom the Sanders developed a long term friendship. The presentation will occupy the spacious lower-level gallery in the new wing, in a special architectural configuration designed by Florian Idenburg of SO-IL architects (New York), who has been shortlisted for the Prix de Rome 2014. From the end of October, the exhibition BAD THOUGHTS – Collection Martijn and Jeannette Sanders will present new work, by Tjebbe Beekman, Gregory Crewdson, Günther Förg, Johan Grimonprez, Markus Lüpertz, Aernout Mik, Ronald Ophuis and Marijke van Warmerdam. Martijn and Jeanette talk about their collection and the meaning it has for them on a short two-pieced documentary for ARTtube. Befriended artists like Anton Henning and Gilbert & George talk about the phenomenon of the private collector and their relationship with the couple. 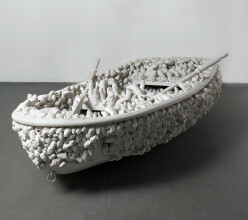 The publication Bad Thoughts – Collection Martijn and Jeannette Sanders accompanies the exhibition. Available in Dutch and English, it will be approximately 70 pages in length. It includes a foreword written by Beatrix Ruf, and an introduction by Martijn van Nieuwenhuyzen, who also interviewed Martijn and Jeannette Sanders. 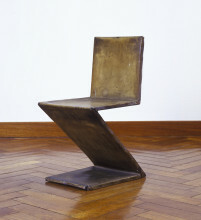 It also features six statements from Anselm Kiefer, Armando, Frank Van den Broeck, Anton Henning, and others.